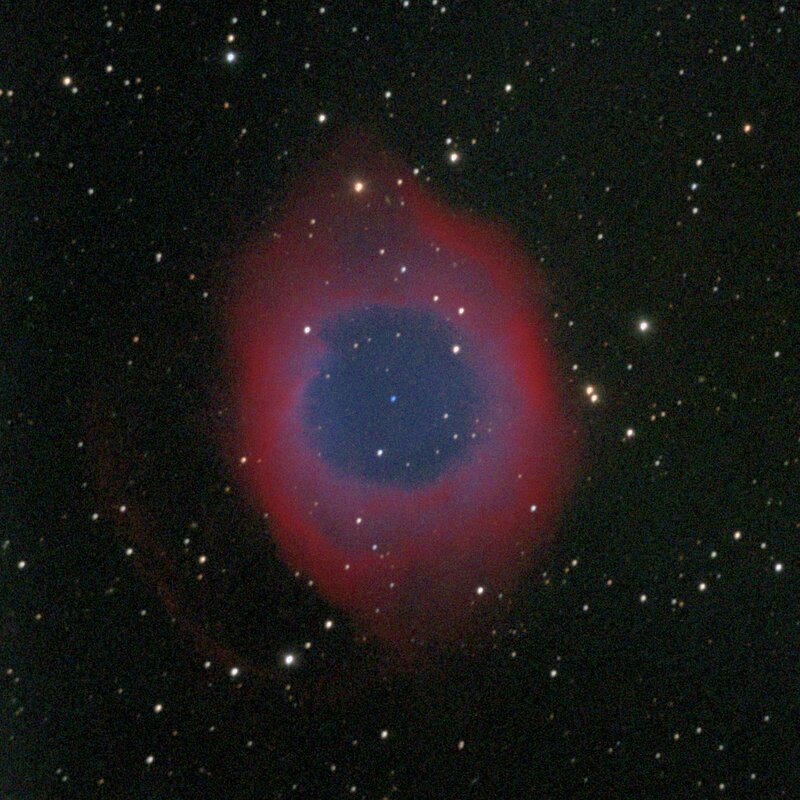 We spent 4 nights near Adin, CA attending the Golden State Star Party. 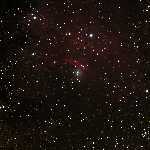 We had clear skies each night and had a nice time there. While this site is very dark, its main downside is the high winds, which peak in the late afternoon but can continue into the night as a light breeze. 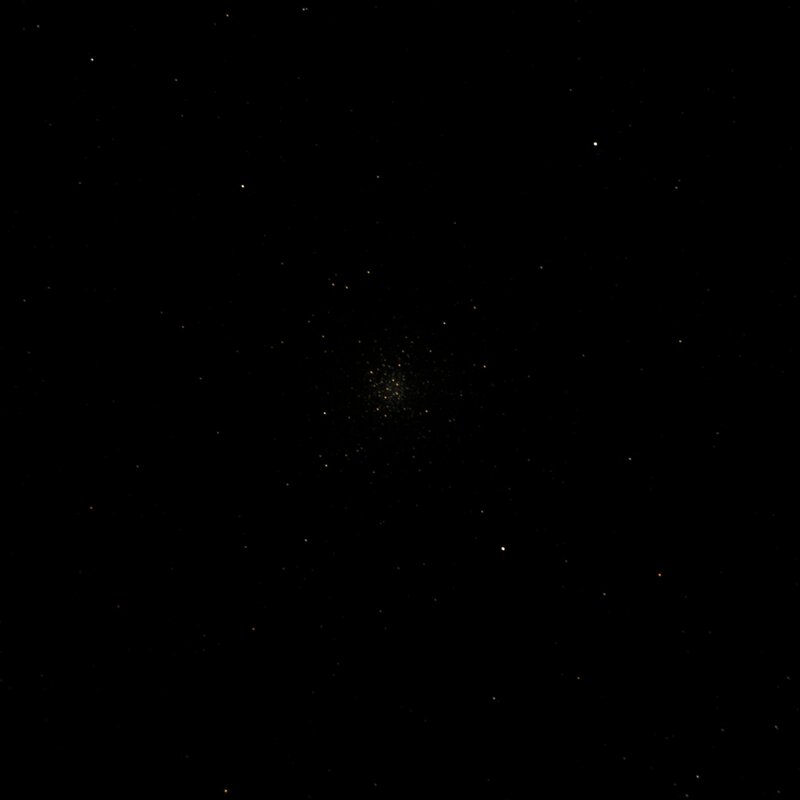 Out setup is quite sensitive to wind, so these light breezes translate into tracking problems when we're trying to take long exposures. 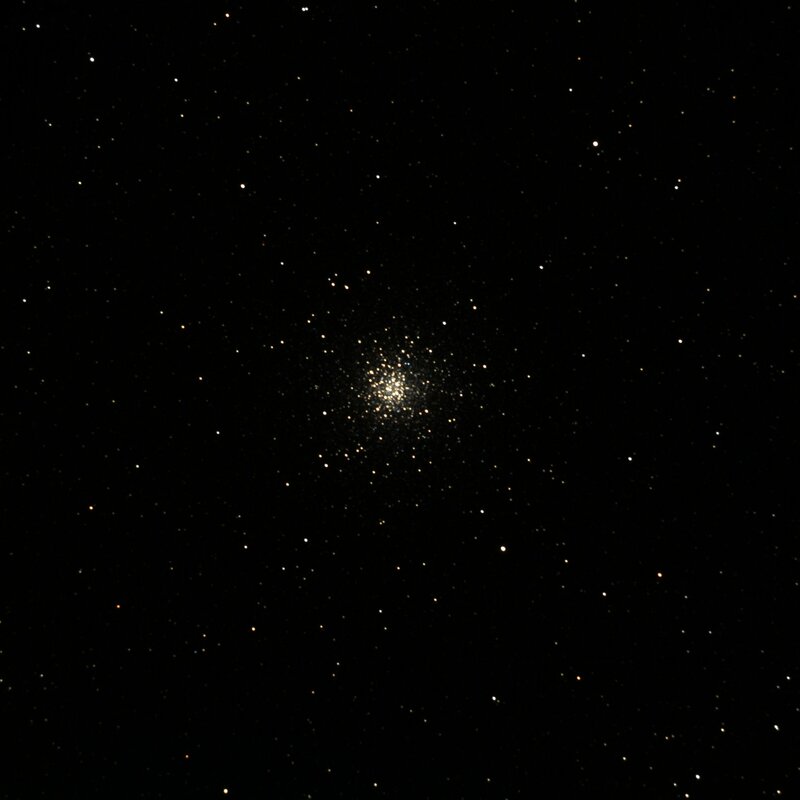 Also, since this was near the summer solstice, the nights were very short, with about 6 useful hours for photography. 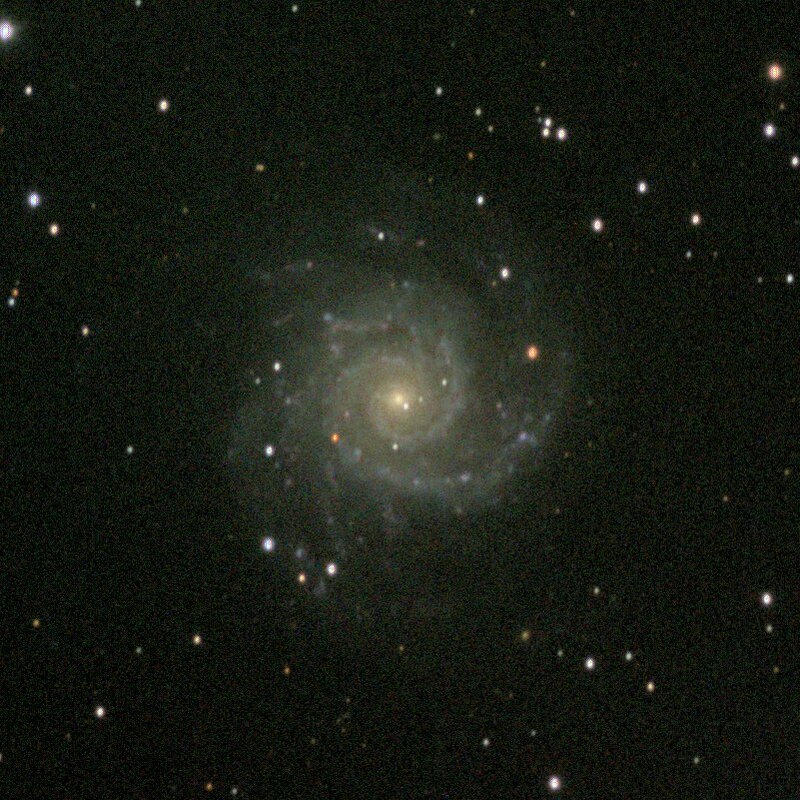 Nevertheless we managed to get some pictures of new objects as well as improved pictures of old favorites. 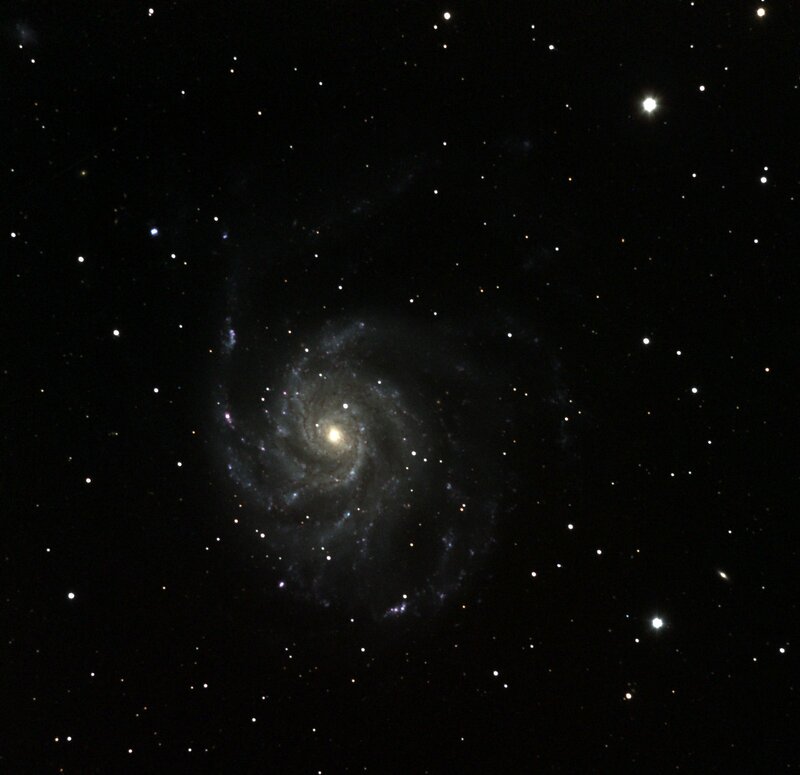 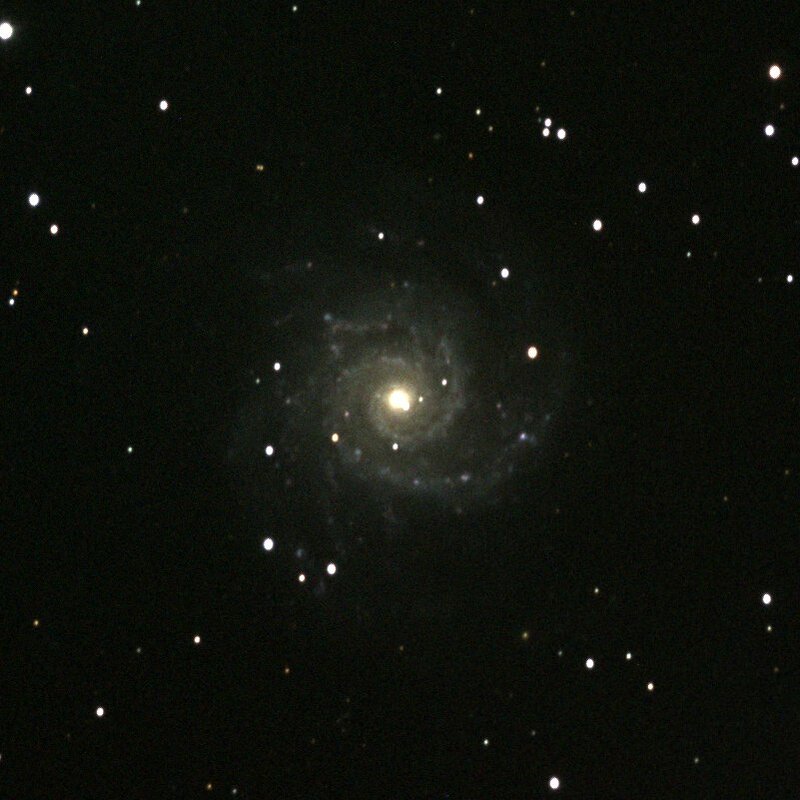 For all images of M101 and supernova SN 2011fe click here. 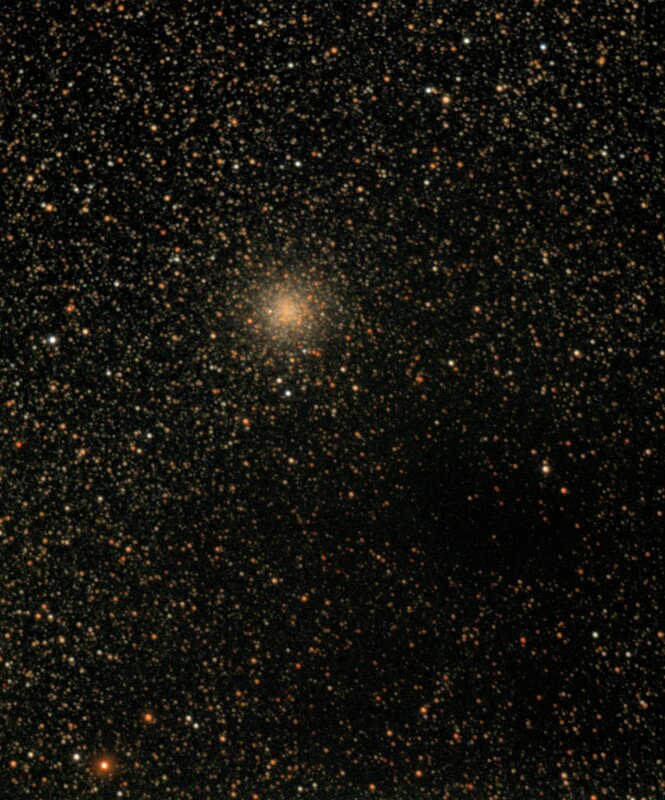 This is a nice globular cluster in Ophiuchus. In the "nonlinear" image, the intensity is scaled logarithmically while the color ratios (hues) are preserved, allowing the star colors to be seen more easily. 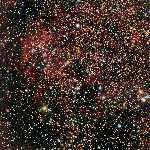 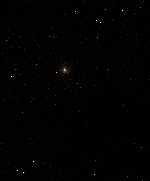 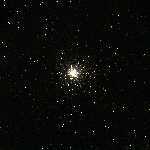 It appears that many of the brightest stars in the cluster are either very "red" (actually orange) or blue. 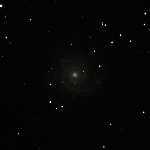 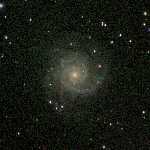 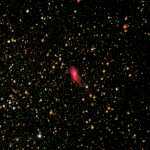 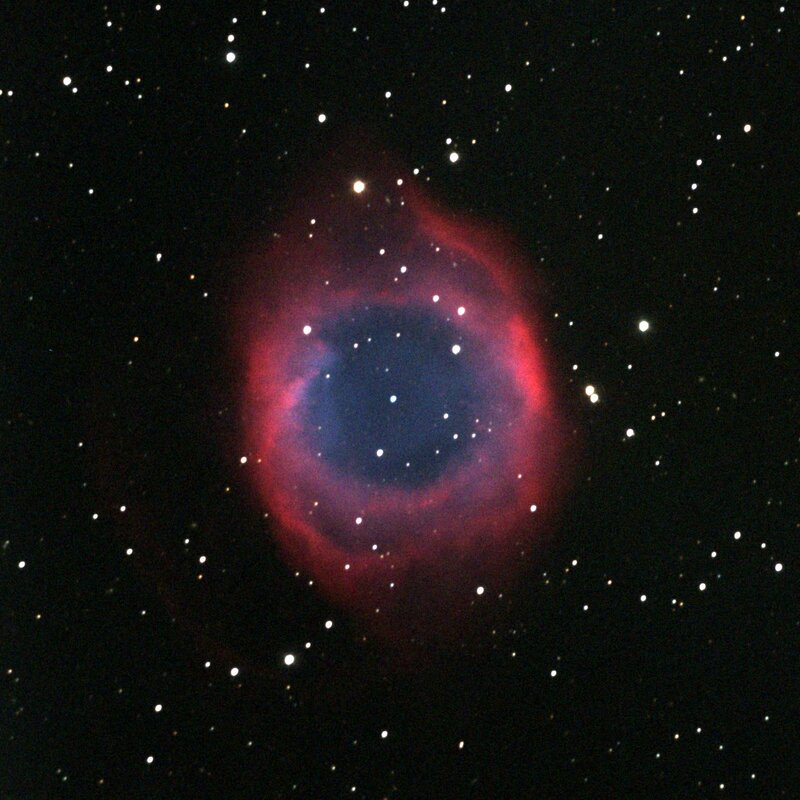 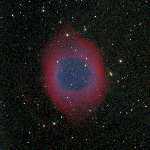 For all images of NGC 281 click here. 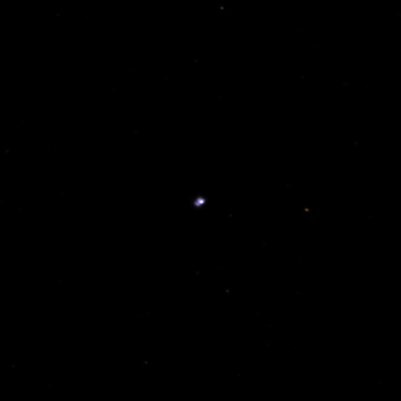 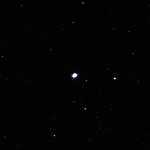 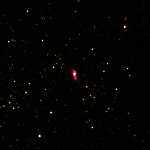 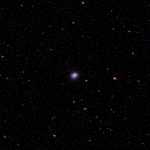 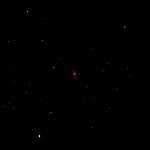 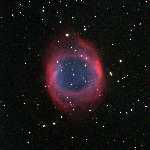 This is a tiny but bright planetary nebula in Cynus. This planetary nebula in Scorpio is quite far south (declination -37°), and at Adin (41° N latitude) it only rises 12° above the horizon. 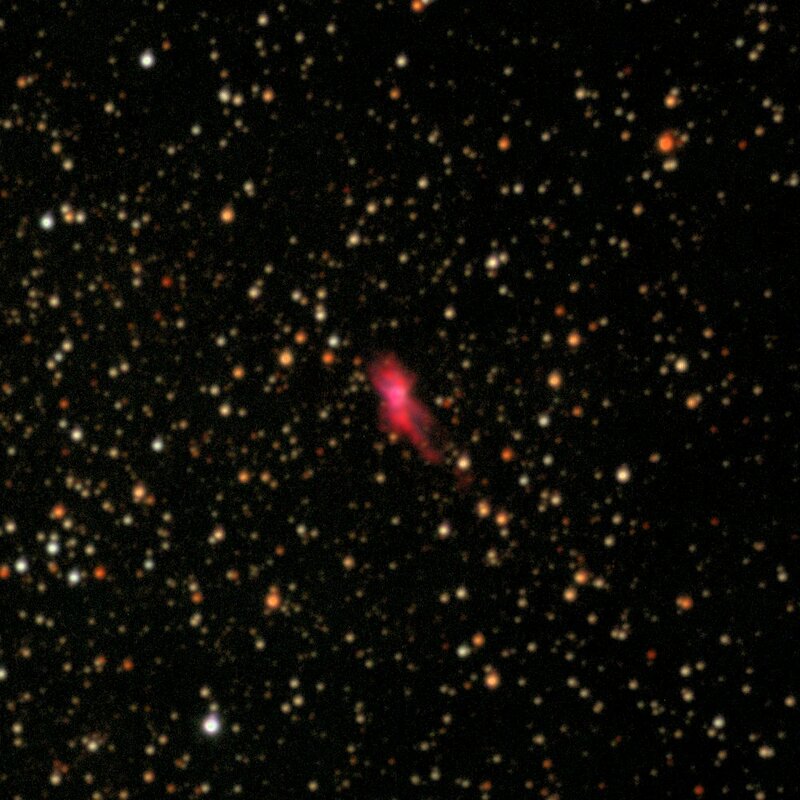 Neverthess, this object was worth a look because of its unique shape. 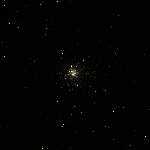 For all images of M16 click here. M16 contains both an open cluster and the Eagle nebula, including the "pillars of creation" that are well known from the famous Hubble picture. 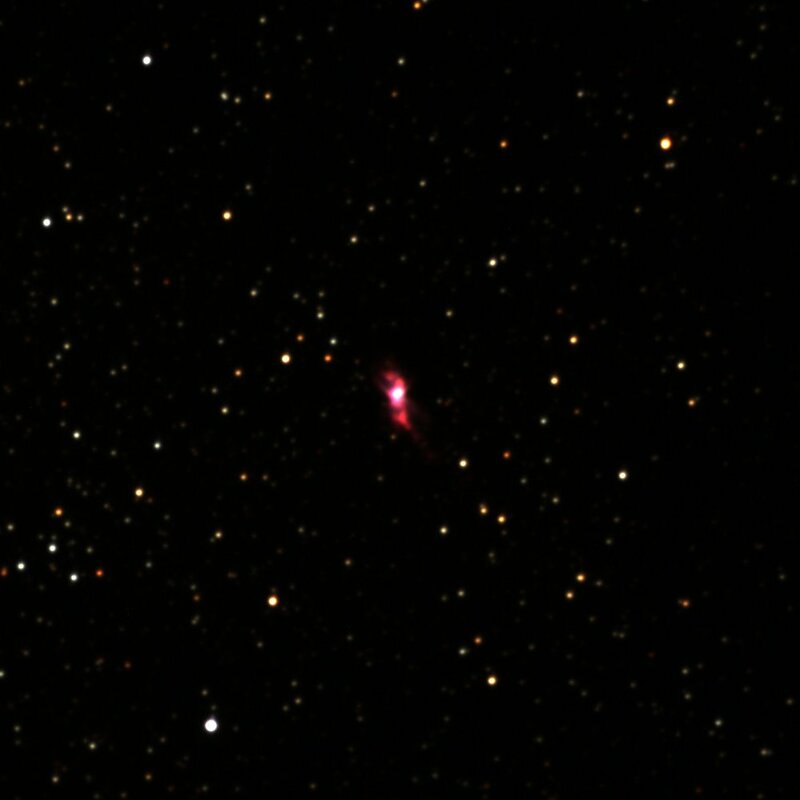 This was an attempt to obtain a larger image using the new camera. 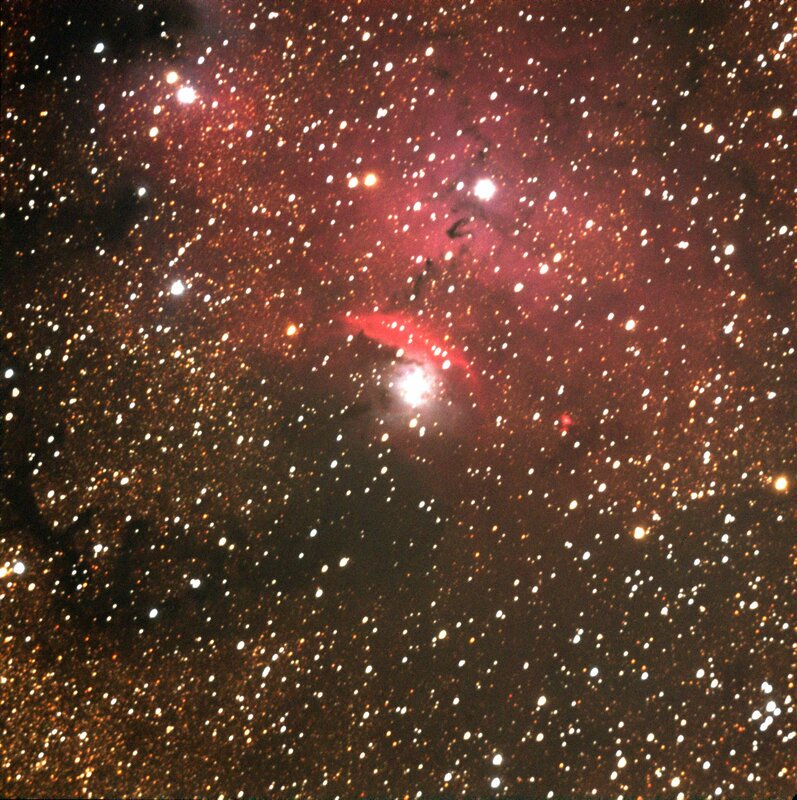 Visually, the faint glow of the nebula was easily seen under the dark skies at Adin, but I still could not detect the pillars visually. I hope we'll get to see this through a large telescope someday. 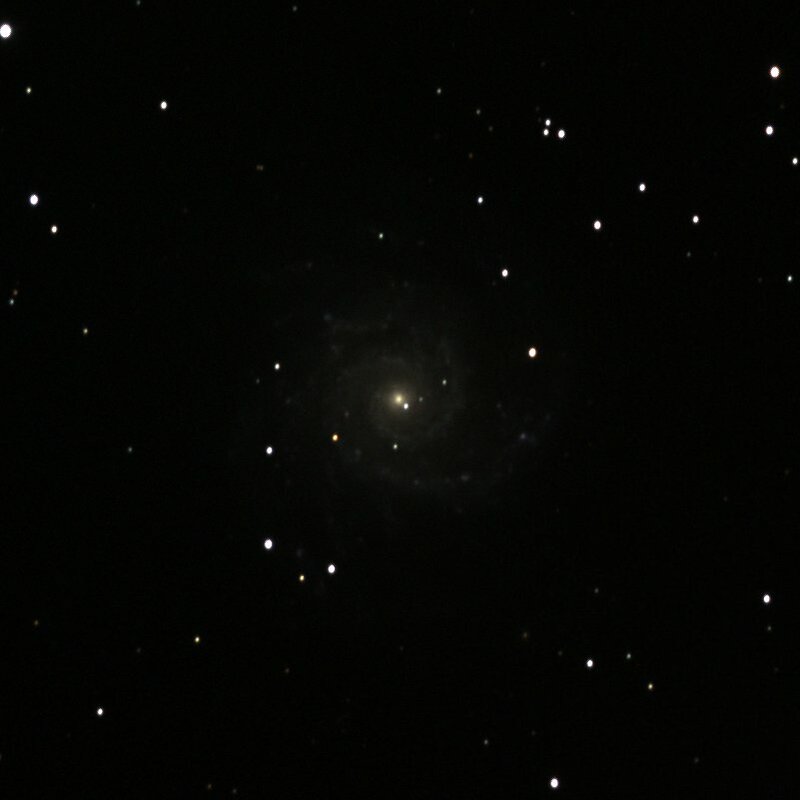 A nice side-effect of the time we have spent on imaging over the past few years is that it has pushed us to look at new objects that we never bothered to look for in the past, and M74 is one such object--chosen by Kathy. 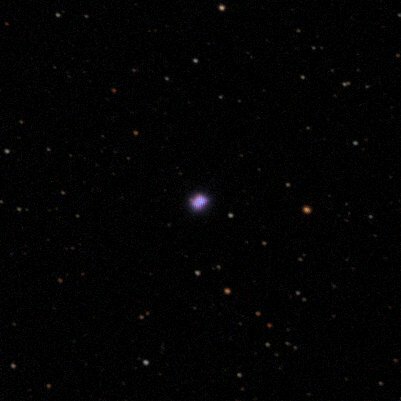 This is a rather faint galaxy, though, and was not very high in the sky when we took this image (and it was starting to get light out). 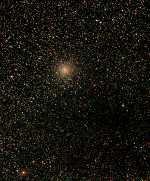 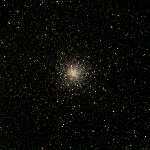 This is a globular cluster in Ophiuchus that is positioned near the plane of the Milky Way. 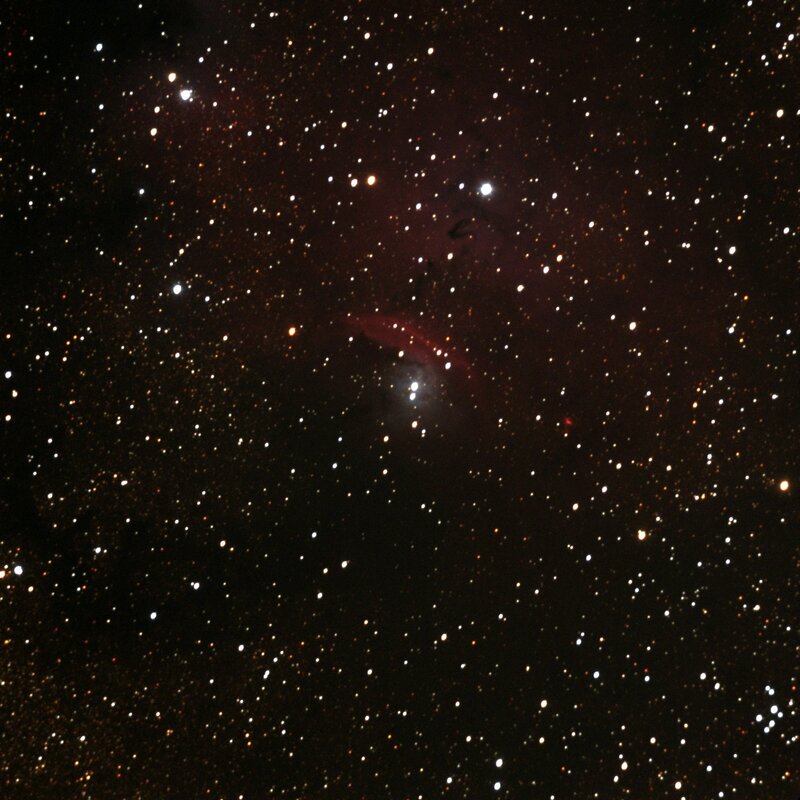 The idea here was to try to catch M9 and the dark nebula B64 in the same image.  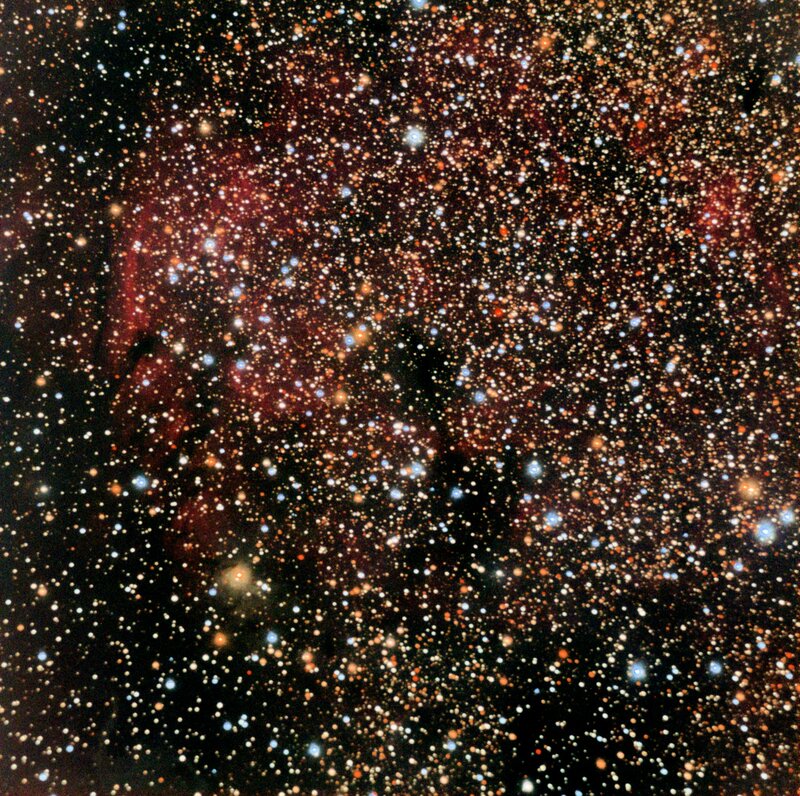 Comparing with other images, it looks like we captured part of the dark nebula in the lower-right part of this image, but the darkest patch is outside the field of view to the right. 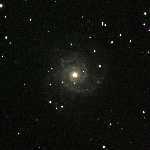 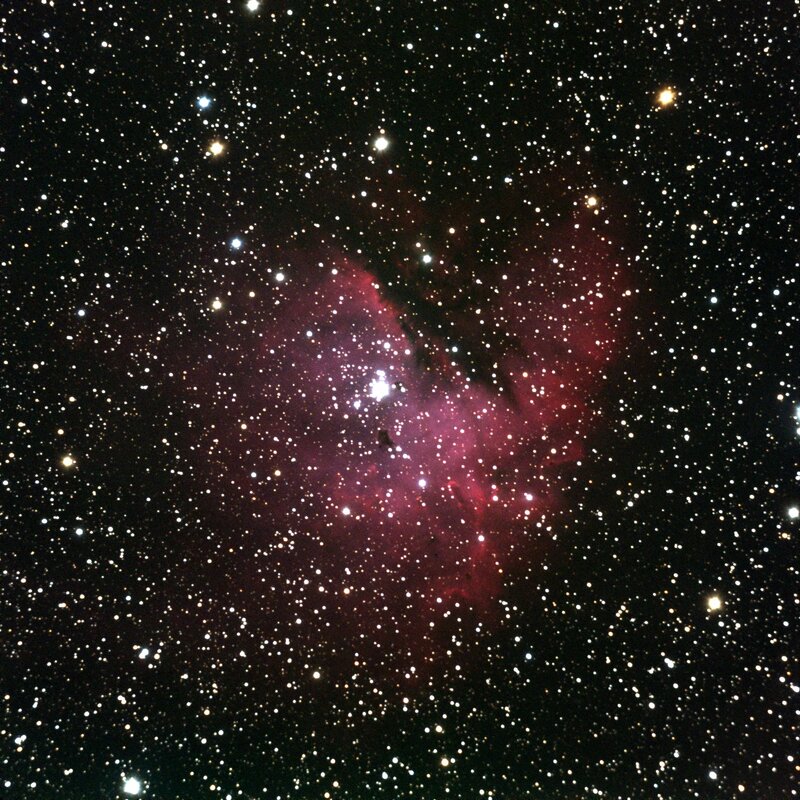 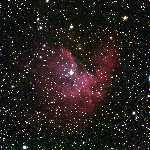 For all images of NGC 7293 click here. 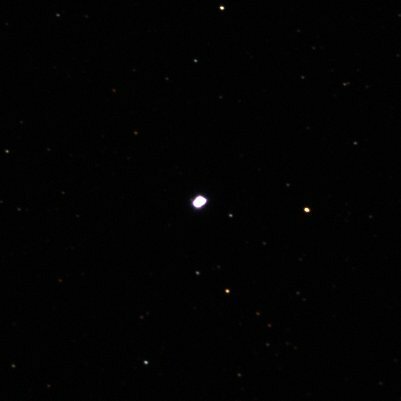 This target was an attempt to get off the beaten path a bit, and was chosen somewhat randomly off the star chart without knowing what to expect. 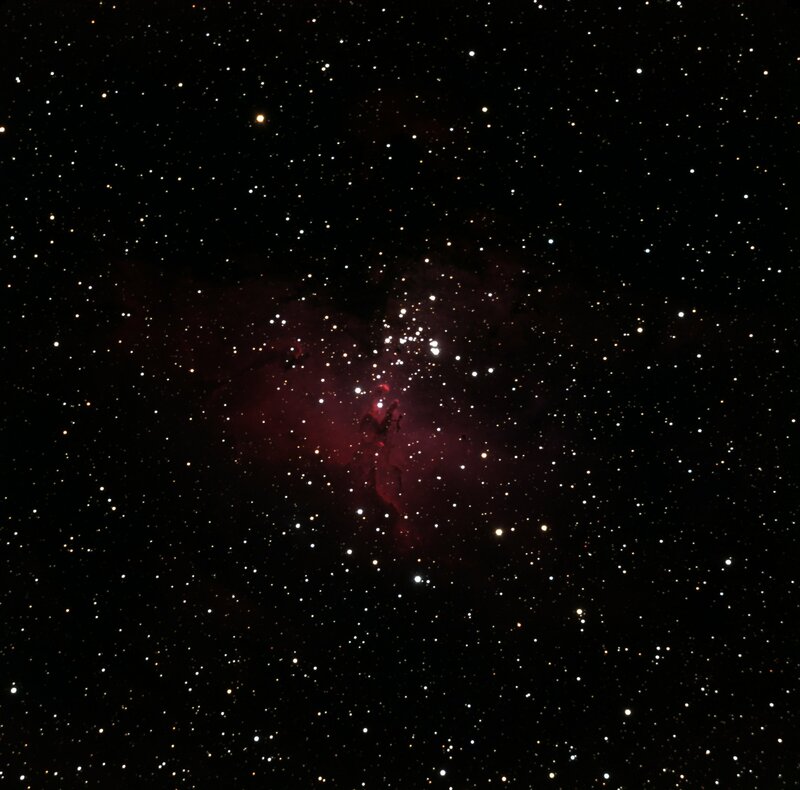 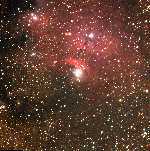 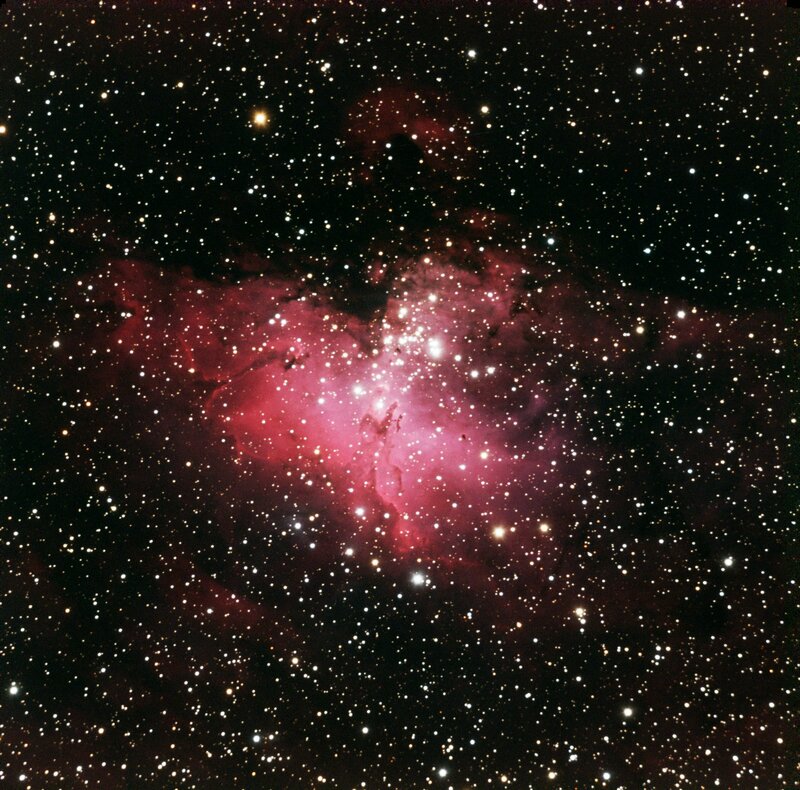 This area of emission and reflection nebulae is located rather close to the Lagoon nebula in Sagittarius. 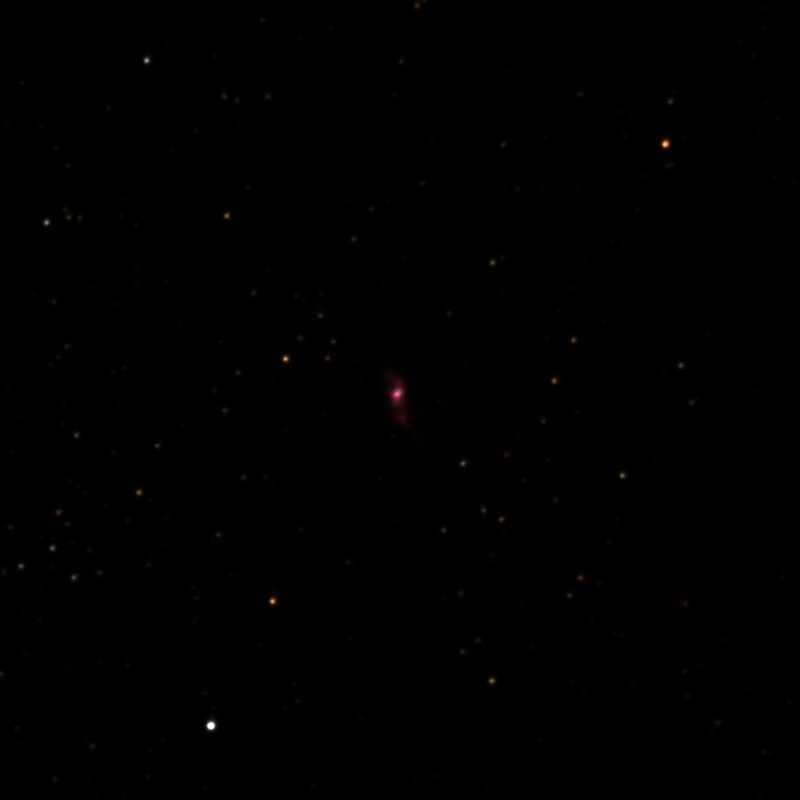 For some reason the wind was really blowing the telescope around during these exposures, and only the first two 5-minute frames were even half-decent.  The intensity scalings 2 and 4 above use only the first two frames, while scaling 1 uses all 7 frames. 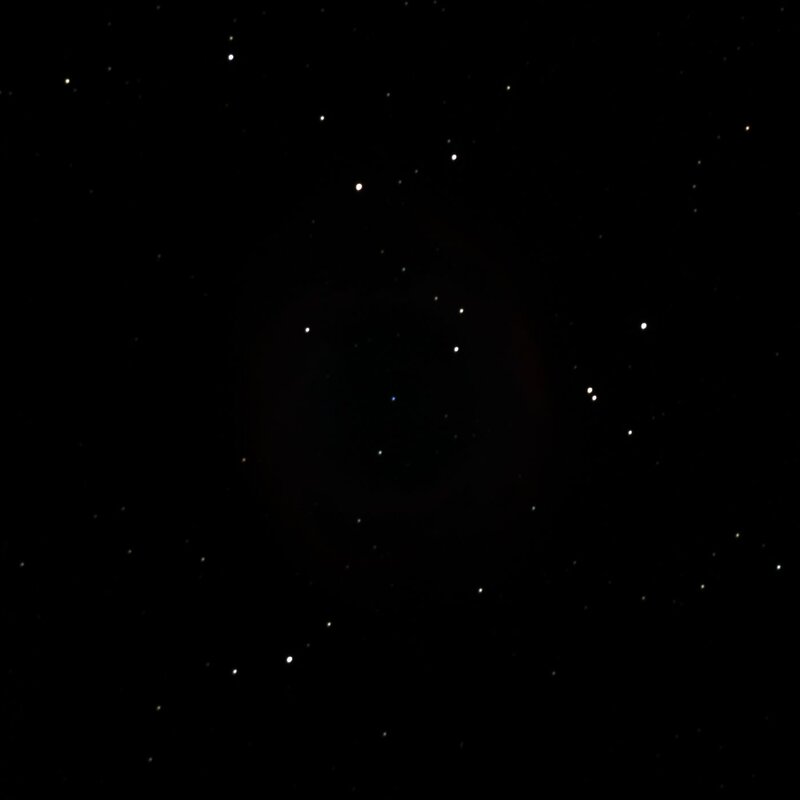 This is an even more obscure target, chosen somewhat randomly from the star chart. 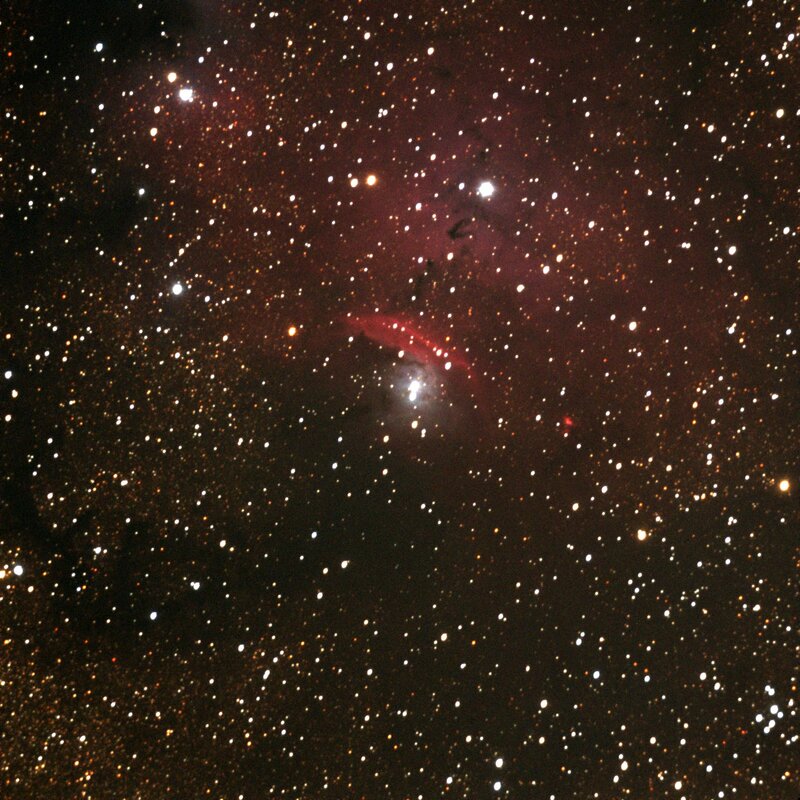 This patch of faint nebuosity (and a lot of stars) is located near the Swan nebula.